It's tough to come back from a two touchdown deficit in football. But a 14-0 deficit in baseball? Amazingly, it wasn't too much for Michigan's baseball team to overcome Sunday. The Wolverines wiped out a 14-0 third-inning deficit to defeat Northwestern 15-14 on Mike Dufek's walk-off homer in the 10th inning at U-M's Wilpon Baseball Complex. "I've never seen anything like it, certainly have never been involved in a game like it," Michigan coach Rich Maloney said. "And, it came in such a meaningful game, too. We still have a real chance to win the Big Ten title. It was Senior Day and we had such a big crowd (1,780). "Fans came down on the field to hug the players. A man I didn't even know came up to me and told me he had watched Michigan football for 35 years and it was the greatest comeback he's ever seen. Sometimes things are even bigger than the game and this was one of them." 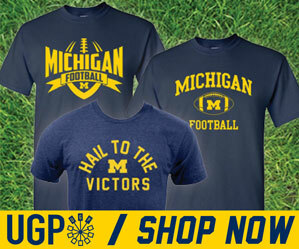 Video highlights courtesy of the Michigan athletic department and mgovideo. I am betting it wasn't very fun ride back to Chicago for the NW team.